About a year ago my friend Mat and I with the help of many many others, got together to design recipes, brew, bottle and make labels for three five gallon batches of historical beer. 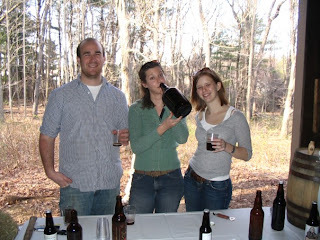 Last April we got to serve the beer to reenactors at the annual Patriots Day battle reenactment held at Minuteman National Park in Concord Massachusetts. It was great to talk to several other home brewers and all of the history buffs who enjoyed the beer. The event went well, the 50 or so people in attendance, including us, managed to drink most of the 140 bottles we brought, leaving us with enough surplus to give anyone who stuck around a couple bottles of their favorite brew to take home. Despite aging the beer less than an ideal amount of time, two of the batches were bottled just two weeks before the event, the general consensus was that the beer was tasty. The only real negative comment I got was that at about 50 degrees the beer was colder than it would have been served historically. The only let down was how little people drank of our Swankey, a low alcohol licorice flavored beer, apparently most reenactors dislike anise as much as I do. Porter, named for the laborers who were the first big drinkers of it, was invented in 1722 as a combination of three different beers, called threads, that would have been mixed together when it was ordered. Eventually many breweries began to make a porter that was Entire, containing all three threads in one barrel, to save the publican time and effort. The dark black color that people associate with modern porters comes from the addition of Black Patent malt the process to make which was not invented until 1817. While this beer is intended to replicate what the Redcoats would have enjoyed back in England, in 1775 domestic porter became available in America with the opening of first porter brewery in the states. Traditionally porter was made from a 1:1:1 mixture of pale, brown and amber malts, however only one company makes amber and brown malt today and these versions are too harsh to be used in such high proportions. We kept with the practice of caramelizing some of the sweet wort to add color and flavor to the beer. Traditionally, due to the expense, hops were added only early in the boil to maximize the bitterness they contribute, the result is a beer without much hop aroma. As this beer aged it got very smooth and smelled just like a bowl of coffee ice cream. Probably not as dark as it should have been. Next time I think I will go with the traditional ratio of malts, and use home toasted versions to make sure that those large amounts of roasted malts doesn't get unpleasant. Swankey was a regional specialty of western Pennsylvania, it was produced for more than a century until prohibition forced the last few producers of it out of business. Refreshing and relatively low in alcohol with a strong licorice flavor this was the soda-pop of its day. Not much is known about this style today, so I based this recipe on the few scant references that I could find and modern day Dark English Milds. This version gets its licorice flavor from two types of anise.The addition of unrefined turbinado sugar boosts the fermentables while keeping the beer light and refreshing. The English yeast we used adds esters and complexities that are probably closer to what yeast of the 18th century would have contributed than what current day American ale yeasts would contribute. I never really liked this beer, but then again I'm not a licorice fan. For such a low alcohol beer it had lots of flavor and did retain plenty of body. Next time I think I'll just leave out the anise, but then it really wouldn't be a Swankey would it? Versions of this beer were originally brewed by more than 100 breweries this past winter to celebrate the 300th birthday of Benjamin Franklin. Franklin is quoted as saying "Beer is living proof that God loves us and wants us to be happy." At the time of the Revolution barley was relatively expensive so many recipes of the day use corn and molasses as cheap sources of sugar to supplement the barley. The tradition of using corn to lower costs and keep beers light in flavor and color is still alive with the beers from Miller and several other American breweries. We used a Scottish yeast because it is relatively neutral, allowing the flavors of the corn and molasses to shine through. The mixture of barley malts in this recipe is intended to replicate the High (dark malts) and Low (pale malts) mentioned in many beer recipes from around the time of the Revolution. All of the hops were added early in the boil for plenty of bitterness, however this drives off most of the volatile oils leaving a beer with not much in the way of hop aroma. Turned out to be a great beer, just had the last bottle a few weeks back. With some age it got some vinous notes and tasted silky smooth. The molasses was really the key to this one. If I wanted to make this more traditional I'd up the corn and the molasses, but as a beer it was great as it. Very Cool! 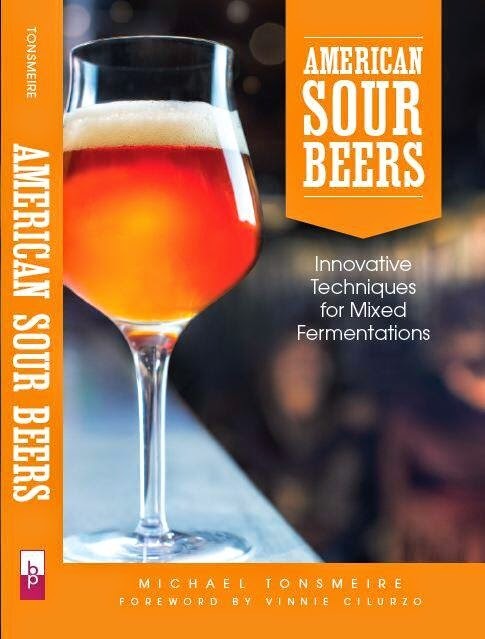 I've been meaning to make a batch of Poor Richard's ale for some time now...Maybe for my next batch...This is a very interesting blog by the way...The sauerkraut and kombucha interest me very much. You should look into sourdough bread..it's a close relative..I make that pretty often. I've been looking at http://fermentedtreasures.com/sourdough.html they have quite a few sourdough starters as well as ginger beer plant and various other cultures. May I call you Mad? Anyway, I live in Austin, a short jaunt from Dublin, TX, the home of Dr. Pepper. They sell "Dublin Dr. Pepper" (using cane sugar instead of HFCS) by the 10oz bottle and 5lb bag. While not a huge fan of Dr. Pepper, I've always felt that it might be a worthwhile experiment to try adding one or two of the 10oz bottles to a stout or porter, replacing some of the malt in a mini-mash. I've not attempted it yet because my brewing budget isn't such that I can afford to throw away 5 gallons of awful beer. Have you ever attempted anything like this? If not, when would you add the syrup so it didn't lose any of it's spicy Dr. Pepper-ness? Never tried anything like it, but BYO had an article a few years back on using Mountain Brew which used a couple gallons of Mountain Dew. I don't think you'd taste just a can or two in five gallons. The only real chance to the flavor would be that the sugar will be fermented out, so I would go heavier on the unfermentables (mash hotter or use more crystal malt). I might just take half a gallon from another batch and ferment it seperately in a one gallon jug with a few cans of Dr. Pepper that way you aren't risking much time/effort/money. I've been thinking of doing a Root Beer Stout, but adding vanilla/wintergreen etc... instead of adding soda. That would be another way to approach this. Good luck, let me know how it turns out! Pennsylvania Swankey was a common style in this state before being lost due to Prohibition. The term "Swankey" comes from the German "schankbier", meaning a beer of lower than usual gravity. This historic and very American style was brewed to be a session beer (a tasty, low gravity, low alcohol beer that one could sip for an entire evening of socializing without becoming too inebriated or too full). In terms of body and color it’s similar to an English Mild Ale. It’s hopped just enough to balance the malt sweetness with American varieties and flavored with aniseed. Our recipe suggests 1/8 oz. (approximately 1.25 tsp.) of aniseed as a starting point. This will give your beer a very subtle licorice character. You can pump it up if you like but be forewarned, a little bit goes a long way and the licorice flavor is not for all tastes. Simple Infusion Mash & Batch Sparge: Bring 5.5 quarts of water (plus the water needed to get to the top of the false bottom) to 165-168 degrees. Add the water to the mash tun and stir in the TBS of 5.2 pH stabilizer. Stir the cracked grain into the water in the mash tun. The temperature should stabilize around ~152 degrees. Cover the mash tun with a lid for 60 minutes. At the end of the mash cycle, recirculate the wort drawn from the mash tun until it runs clear. Drain the mash tun completely and measure the amount of liquid you collected. Add enough additional sparge water @ 171 degrees to give you the appropriate pre boil volume (usually 6 gallons) based off your boil off rate. Stir well and recirculate until it runs clear again. Collect the remaining liquor from the mash tun and add to your boil kettle. Adjust the heat to bring the sweet wort to a boil. Maintain the boil through the following additions. Add the bittering hops and boil for 50 minutes. Add the whirlfoc tablet and continue to the boil for 10 more minutes before removing the stock pot from the boil. Start cooling the wort ASAP. It is most desirable to cool the wort to an acceptable pitching temperature within 30-45 minutes. Strain (if possible) the wort into a sanitized fermenter and pitch the yeast once the wort has cooled to ~68 degrees. Active fermentation should commence within 12 hours with proper yeast management.